That's the reality for my clients, let's make it your reality too! Say goodbye to the fog, the uncertainty, the doubts, the fear. Say hello to Workshop Wonderful, an 8 week online course to help you create incredible, game changing workshops that feel oh-so-good! I know that now is your time. And I know that you and I make quite the pair. You see, you and I go way back. I've spent many hours, days, weeks and years getting to know you. Just as it's your mission in life to change things for the better and leave your mark on this world, it is my mission in life to help you stand up and shine brighter than the sun. I know just how much you care. You may write the word workshop in the description but really, it’s so much more than that. It’s an occasion where you connect people to life changing possibilities. It’s an opportunity to lead, teach, support, expand and heal. Another way to give and receive, to empower and engage. Over the last ten years, I have had events full of successes, triumphs and heart-swelling greatness. And with that came tears, frustrations and that thing we love to call a learning curve. I’ve worked with big budgets and I’ve worked with no budget. I’ve worked with long lead times and I’ve worked with only days notice. I’ve worked with high end CEO’s and I’ve worked with community volunteers. I’ve worked on events for a handful of people and those for hundreds of people. I’ve worked on events that went for a few short hours and those that went on for days. Through it all, I've seen the good, the bad and the positively fabulous and with my work specialising in high level events for passionate entrepreneurs and business owners, I've got everything you need to give you a reputation for throwing the best workshops in town. Let's get one thing clear, I don't like fluff (well, unless it's on a kitten). I am here to show you how to run incredibly fulfilling workshops minus the crazy stress that can completely overwhelm you if you don’t plan effectively. And when you are a business owner with a to-do list already as long as your arm, I know you don’t have time for that! I've spent YEARS doing all the hard yards so that you don't have to. When it comes to this course one thing is for certain, I have a lot to give and I am giving it all to you. 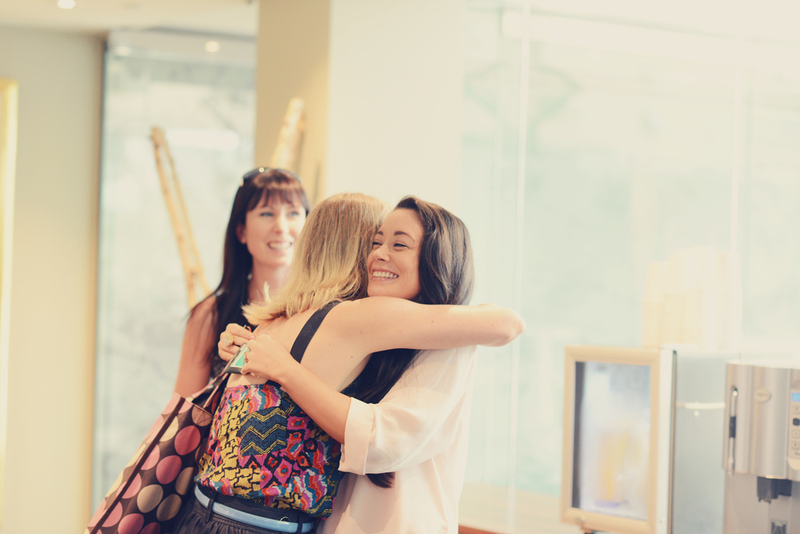 And if you want to know a little more about what goes on behind the scenes in my business, I can tell you that my days are lovingly filled with clients make my heart burst with happiness and I have the pleasure of working with gorgeously divine movers and shakers like the Beautiful You Coaching Academy, The Wellbeing Web, Earth Events, Kathryn Hocking, the Blogcademy and Gala Darling. Every week I am practicing what I preach, planning, managing and assisting at all types of events all over the world and coaching motivated clients on creating successful events and building up solid business foundations. I'm proud to say that over the years my work has been featured in The Herald Sun, The Age, MX, Channel’s 7, 9, 10 and The ABC, The Circle, The 7PM Project, Nova FM, Mix 101.1, Kara’s Party Ideas, Pop Sugar Moms, Mum’s Lounge, Inspired Coach, She Will Shine, Roooar Magazine, Raspberry Magazine, Happiness + Wellbeing Magazine and more. And I am beyond grateful to have a three month waitlist on my VIP coaching sessions and have client bookings in my diary until November 2016. This course is one way that you can access all of my knowledge and tools immediately so you can dive in head first and make workshop magic. Jade is professional, polished, and always in control of every detail at our events. She is at once motivating and energising for my team and others to be around, but also as cool and calm as you would want a pro event manager to be at those inevitable times when things don't quite go to plan. If events are an important part of your work and business you truly could work with no one more accomplished and skilled than Jade. What a dynamo! Not only is Jade incredibly lovely to deal with, but this woman gets. it. done — quickly. With full-to-the-brim schedules in the lead up to our two day live event, leaving the behind-the-scenes organisation of INFINITE in Jade's hands was, honestly, the best decision we could have possibly made. Can't sing your praises enough Jade, thank you! Jade is an event management super-star! I run a very busy multiple six-figure business and part of that is beautiful events around Australia for my premium mastermind. I turned to Jade when I realised that I just did not have the time (or expertise) to manage these events myself. Jade's work has been quite simply perfect and I can rest at ease knowing everything is taken care of. She even achieved significant savings on my events in the first week she was working with me. Jade is my go-to events girl and she should be on your team too! The Blogcademy worked with Jade to host our first ever Mixer event in London and despite her being half way across the world she was amazing to work with! Communication was easy and she made our event run smoothly from afar. Even better, she was able to travel over to London to be with us in person on the day. We can't wait to work with her again and would totally recommend her to others! Jade and her team were FABULOUS. I actually contacted her a few days before my event in a bit of a panic - worried about how I was going to do it all myself, but Jade handled everything - including things I had forgotten about or were stupidly trying to do last minute. She made the event stress-free and seamless. I can't recommend her highly enough for your next event! Jade's vision to map out and manage a standout event is brilliant. Her attention to detail and beautiful nature mean that she will lovingly guide you to create an event better than you ever dreamed possible. If you get a chance to work with her, do it! If I need to run an important event, I call Jade. Running events takes a lot of time, knowledge and effort, and I can rest easy knowing that Jade is there to bring my vision to life and help create an event to remember. From the venue, suppliers and planning to all of the little to-do’s that take up so much time, Jade can take care of it all, as well as assist on the day so I can focus on facilitating and connecting with my attendees. Jade’s work is fantastic and I recommend her highly for your next event. OR three monthly payments of $350AUD + GST for Australian Residents or $350USD for International Residents. What if you could spend 8 weeks lovingly creating an event that is so good, it gives you goosebumps... AND serves you for a lifetime? What if you could do this with an event professional (me!) by your side the entire time? And what if you had access to the tools, templates, checklists & insider info that i have developed specifically for entrepreneurs & small business owners? Well, you can! You don't have to do this alone, you can navigate through the workshop waters with me by your side. Believe me when I say you can’t google this content and find anything similar in the market. You will not get a course like this for business owners bursting with this many comprehensive and strategic planning tools, templates and information anywhere else. You will have absolutely everything I use for my own events - nothing is off limits. I will be giving you eight weeks, seven modules, seven weekly office hours, one live call and a lifetime of beautiful workshops and events. Each module contains a weekly video, audio and powerpoint with transcripts, worksheets and templates. Each week serves it's own purpose with enough space and time for you to complete the actions and stay on track to create a successful event. Here's a little sneak peek of what is inside - this is just one, tiny little part of what you get! Now let's look at each of the modules and what we will be covering in each one! My signature 5 step process is the very foundation of everything you want to achieve and everything you want to give. A vital step in the event planning process, this is something that most people never get clear on but will change the way you run workshops forever. Workshops and events are not a separate part of your business and should actually be a fulfilling part of your business offerings. Learn how you can use workshops to fill your other services and offerings and create a seamless cycle. Getting clear on what needs to happen and when not only allows you to be organized, it frees you from overwhelm. You don’t have to do everything at once, crying from the sheer amount of work to be done. The simple system I have for you allows you to move through each week at a time with the confidence. Your sales page is the cornerstone for your workshop. Confidently talk about your workshop, attract your dream attendees and sell tickets easily, all with an understanding of what key information grabs people's attention. This a power punch week aimed at ensuring you have implemented the existing tasks and are well prepared for the next part of the course. And with a live Q&A call, this is your chance to ask me all of your questions! I’ll be on that call as long as you need me! The words ‘marketing’, ‘promotion’ and ‘sales’ can strike fear into even the most confident of people, but your workshop won't get any traction if you don't talk about it. Together, we will reframe promotion and sales for you and give you the tools to promote your workshop with a passionate message that cuts through to the heart of your audience. Don’t make the big boo boo of not using your workshop to fuel your business, even when you don’t have a current event on. Gain raving testimonials, get beautiful photos, attract new clients and build up your credibilty as an industry expert that everyone wants a piece of. Sponsorship can be an amazing way to build beautiful partnerships with like-minded and supportive businesses to lift your event experience even higher. From gift bag goodies, to venues, to photographers, to florists, to paid packages and more, sponsorship plays a key component in most successful events. But the fun doesn’t stop there! Check out these beautiful bonuses that are yours for FREE! Kelly-Ann Arthur // Nervous about presenting or speaking in front of an audience? Kelly-Ann, Creator of My Soul Speaks, gives her best tips to help you stand up on stage and shine! Eliska Lam-Chan Siy // Not sure how to make your event Instagram worthy? Eliska, founder of Ruffles & Bells, shares her best event styling tips and tricks that will get everyone snapping! Fi Mims // Want to get photos that do your marketing for you and sell future events? Fi Mims, of Fi Mims Photography, gives you the insider scoop on how to capture shots that will pay dividends for years to come. Kate Toholka // Confused about how to grow your community? Kate, an Online Success Coach and Digital Strategist, is going to help you rock the online world and amplify your presence. Niki Hennessy // Do you want to communicate with your audience in a powerful and authentic way? Niki, from Conscious Communications, will help you nail everything from your sales page to your presentation. With a blend of visuals, audio interviews and behind the scenes info, these case studies of successful events and their passionate creators are going inspire you and show you exactly what is possible for your own beautiful business. I’m pulling in the big guns and offering you some amazing bonus interviews from some of the hottest names around town. These babies are all full of golden insights and nuggets of wisdom. Pull these out whenever you need some extra inspiration for your own workshops. I wanted to run more of my seminars and events, but was overwhelmed with the time commitment involved and all of the logistics. I had no idea how to best use my Virtual Assistant to help me plan live workshops, but knew I wanted her to help me with the planning and preparation. I was also a little bewildered about the best, and most authentic ways to promote my events (even though I've run a couple before). The Event Timelines and Promoting Your Event modules whet my appetite. This was exactly what I was needing, as someone who's relatively new to hosting my own events. As an experienced speaker, the delivery of the seminars didn't concern me, but the organisation and promotion was something that I admit filled me with fear. Jade eradicated all these fears and the modules helped to empower me to realise how simple all this could be. I expected to learn more about the logistics of planning and running events (which I certainly did). However, I learnt SOOOO much more than I'd envisaged, particularly about how events fit into my overall business model. It sounds so obvious but I'd never critically thought about how I could use events as a marketing tool for some of my other offerings and how I can use past speaking engagements to promote future events. The eCourse was so professionally presented and easy to digest in multiple formats. I was so eager to jump in each week and access the content. I now have a library full of templates and resources that I can easily adapt and re-purpose to run events in the future. I have a clear idea about the tasks that I can have my assistant perform and I also have a much clearer understanding of my purpose for hosting events which again, is something I really hadn't given a lot of thought to previously. I have a very clear idea of effective ways to promote my events, without feeling like it's an overwhelming or 'sleazy' task. Before Workshop Wonderful, I was feeling scattered and all over the place and I was having difficulty deciding what type of events I was wishing to hold. I had too many ideas which were making me feel a bit loopy and overwhelmed. I knew workshops and events were something I wished to develop and I knew by doing this course I would be learning from the best. I have been to events Jade has put on and they are always spectacular - beautiful, well thought out and lots of fun - just the type of thing I want to hold. I just knew the course would be filled with so much goodness. The content absolutely blew me away, so much of the information is not just for events but can be applied to so many other aspects of your business. The information and worksheets enabled me to start thinking super clearly and specific about various aspects of my business and some super fun ideas about the type of events and workshops I wish to hold. I now have a great timeline and checklist of what needs to be done to ensure a great event from the start to finish and even around continuing the relationship afterwards with my community. I have awesome questions I can use to gain clarity of my purpose of not only my events but my entire business, brand and where I am heading moving forward. I also now have insanely good ideas for promo via social media (something I have struggled with) and how events can boost my brand and vica versa. The course was SO amazing and thorough - each week I was so delighted with the amazing content and how beneficial it was and how many great ideas it gave me. I will come back and do the course and revisit the content over and over again as I develop my business. I would recommend that if you are even pondering adding events as part of your business or brand that you DO WORKSHOP WONDERFUL! Jade is so generous with her expertise and knowledge and as well as setting you on the path to be a workshop pro. It will be SO beneficial for you to gain clarity and direction towards your business and brand. It is absolutely one of the most comprehensive, practical and beneficial courses I have ever done. Prior to this course, I didn't have a clear vision for hosting my own workshops or events. While it is speaking that lights me up, I struggled to think of how I could put my skills and passion into an event that would serve my ideal clients and offer something unique and inspiring. But I knew that if anyone could help find a vision for my running events or workshops within me, it would be Jade! She has such a passion for what she does and the rare heart-fueled, soul sparkling passion that you just want to be part of! Everything Jade does is so professionally executed and her products and services are always polished with precision. They always provide you with something that has the WOW factor. I knew anything Jade was offering would be full of uh-huh moments and love... I wasn't wrong! It seems so simple, (and I think that is part of Jade's genius), but she prompted me to connect with the vision that was already there but I hadn't yet found! I now have a really great plan for what I want to create with my workshop, how it will connect and be of service to my clients, how it will complement my plan for my business and importantly what I need to do to make it come to life! It feels fabulous! The course for me was exciting, inspiring and productive and I am so grateful for this experience. I can honestly say I am not surprised by the amazing presentation, content and deliverance of Jade's eCourse Workshop Wonderful. Jade has shared such valuable information and has completely changed the way I will be delivering my workshops. The information shared is outstanding and the confidence I've gained in knowing what I'm going to deliver and how is confidence boosting. My perspective on the value of a workshop and giving your clients the right impact has escalated to a whole new level. Don't continue giving your clients boring workshops, make them memorable. I'm so grateful to have done this course. Thank you Jade. The first and second person to register will receive a complimentary one hour, one-on-one skype coaching session with me and full workshop review valued at $600. Use this coaching session anytime in during the course to talk to me personally about anything to do with your business and workshops. And receive a full workshop review from your submitted course work at the end of week 8 of the course. The third and fourth person to register will receive a full workshop review done by me from your submitted course work at the end of week 8 of the course valued at $440. That means you get an event professionals’ eyes over all of your work, assisting you in shaping the best workshop your attendees have ever been too! The fifth person to register will receive one hour virtual event assistance and the Ultimate Event Toolkit valued at $105. Use this anytime during the course so we can help you find your perfect venue or fabulous suppliers to make your event a gorgeous one to remember! Don't make the common mistakes most businesses make when running their workshops and don’t miss out on the exciting opportunities that come with running your own events. Use your events as fuel to lift your message higher, establish you as an expert in your field and fill your one on one offerings till they are bursting at the seams. When does the course start and end? The next live round of Workshop Wonderful begins Monday 30th May at 9am, with the last module released Monday 18th July 2016. Do I have to have a workshop ready to plan when we start? This course is fabulous for those who have a workshop idea ready and are keen to start the planning process, but just need the knowledge, timelines and templates behind them to get it all up and running. If you don't have your workshop idea set in stone yet though, that's completely ok! You will still get so much out of the course and have everything you need to run your workshop successfully down the track. The information and tools I give you are timeless - I've been working with most of these for over a decade - so they will be ready for action when you are! Regardless of where you are at in your workshop planning process though, I strongly encourage you to complete each module weekly and attend the live calls to get the most out of your investment. When do I access each module? Each new module is released weekly on a Monday morning 9am AEST. This includes a welcome video, audio and powerpoint, transcripts, worksheets and the applicable templates and checklists. You will receive an email from me letting you know when each new module is released and remind you to log into the membership site for access. How long will each module take me? Depending on the size and intensity of your workshop plans, each module will take around 1 - 2 hours a week to complete including watching the video, listening to the audio and completing your worksheets. Additional time will be needed if you are planning your workshop throughout the course, so if that's you, do set aside time for additional activities such as venue hunting, creating your promotional schedule, writing your sales page etc. Are all the templates and info mine to keep? Absolutely! All materials are downloadable for your personal use and can be used again and again for any workshop or event you run now or in the future. *Please note however that all information contained in this course is strictly copyright and is not to be shared or reproduced in any way. Do you offer refunds if I feel the course isn't right for me? I believe so passionately and wholeheartedly in the quality of content in this course that if for some reason you are not 100% happy, I will refund your full investment. I can give this guarantee to you because I know that if you are committed to doing the work and taking action, you will reap the rewards and have impactful, skillfully organized and well run workshops that impress. All I ask is that you contact us before the beginning of week 3 with your completed worksheets and we will organise your full refund. Please note that change of mind refunds before the course starts will not be provided, you must demonstrate that you have participated in the course before requesting a refund. How often does Workshop Wonderful run and if I sign up once, do I have to sign up again for future rounds? The beauty of Workshop Wonderful is that once you're in, you're in for life! As long as this course is running, you will have access to each and every round without paying a cent more! Even so register now and reap all the benefits! Have more questions about the course, the content or the inclusions? Send us an email HERE!